A manager is a director and responsible person who assigns and monitors work to a group of individuals working with him. The most important profile of a manager is to manage his people well rather than doing any work. He should be an all rounder and familiar with each area he is supervising. It is the rights of a manager to evaluate employee and recommend for their promotion. He has the authority to change the work profile of his sub ordinates and team members. The title of a manager reflects what he is eligible and responsible for. For example, an accounts manager is responsible for supervising accounting functions. Similarly, an operational manager reviews the operations of the company. All the departments in an organization needs a manager, so regardless of the title, the work of a manager is to plan, direct, control and monitor the people and their work. A manager should like his people, he should be comfortable handling conflicts. He should know how to extract work from different types of people and how to motivate employees as per their requirements. If a manager is better at computers and not at handling people, he is not fit to become a manager. He should keep his people organized and regularly updated in their work schedule. He should be disciplined and keep his sub ordinates disciplined and organized along with him. how to motivate employees as per their requirements. If a manager is better at computers and not at handling people, he is not fit to become a manager. He should keep his people organized and regularly updated in their work schedule. He should be disciplined and keep his sub ordinates disciplined and organized along with him. Organizations need managers who are visionary and identify the next step of product or service whose demand shall increase in the near future, and will strive to bring the supply in tune with the demand. This quality can be developed in a manager who is goal oriented and know how to effectively use the resources. All types of communication should be very effectively conducted by a manager, be it presentations, public speaking, written communication including email and letters and Tele-conferencing. A manager should have well developed skills for face to face communication. Maintain routine updations system and feedback from upper management. It is very necessary for a manager to know the information and status at any point of time, so he should keep himself well informed of the matters going on around his area of supervision. Sometimes managers do face situations which are technically complicated. In such cases, they should be able to give technical guidance and decide the best strategy for overcoming such situations. A technically proficient manager knows the problems that may arise on mismatching of the routine work. So he should be accustomed to this well in advance. Managers are expected to take proper care of the employees and their needs. Building up a corporate rapport by climbing the levels shall be a secondary goal. Success for manager is when his team is satisfied with his work culture and his team has no other requirements. If a manager gets bonus, he should distribute equally among all the employees. He should avoid any favoritism or partiality in his behavior with the employees. Team work is encouraged when a manager sits and works with his staff. When he involves himself as a co member of his team rather than a leader at the time of work. Working with the team will inculcate a behavior of discipline. The team members will start respecting you by the amount of knowledge you have and you share with them for their growth. Team work means all the members have equal responsibility and share of the work. They should feel that individual contribution of each member shall be highly solicited and shall be entertained for the quality improvement of the work given. A manager should be professionally dressed and act in professional manner all the times so that he can give strict guidance and set a disciplined example for his staff and others. When he will come on time and maintain punctuality, then only will he develop right to ask his staff to maintain the same. A manager should create so many ambiences that even if in his absence, his staff will carry on with their work in a disciplined manner. When your staff is professionally sound then they expect a professional treatment from the managers. A professionally qualified person will not be satisfied when he will be assigned work related to clerical matters. He shall be given that much respect because of his knowledge. Other than emergency cases, a proper hierarchy shall be maintained qualification and experience wise so that there is no conflict between employees relating to work. Maintain your professional attitude towards work. Make charts, analysis and comparatives on a periodical basis so that you are updated with the whereabouts of the operations going on. Prepare lists and deadlines for completing your scheduled tasks. Complete your tasks in an organized and clean way. Make your work presentable and understandable by the users. Impart uniqueness to your work which can be distinguished by others. Let your work contain extra data or one step ahead analysis from the regular approach. Analyse your work from all dimensions, sometimes apart from your field. Always keeps his door open and his employees are instructed to enter his room without asking, is one of the good qualities and skills of a good manager. This type of arrangement makes the employees feel that they are all a team they can discuss the matters freely. When the doors are open, the question of suspicion does not arise at all. The employees are also steady that they are being watched. Understand the caliber of the employees and assign them work accordingly. Maintain a system of assigning work when the office starts and take the feedback at the end of the day. Assign targets for completion and bonus for completing it early. This type of management will inculcate a competitive feeling among the employees and they will work energetically. When an employee does mistake, it is the duty of the manager to make him understand and rectify his mistake. Not that he will humiliate him in front of the members and laugh upon him. An employee will want to learn from his mistakes when he is addressed politely or in closed doors. Humiliation will always have adverse effect on the employees. If an employee has achieved something, you should reward him and make him proud by honoring him in front of the management. When employees bring their working papers and way of working then the manager should enquire and question him on the process followed and the reasoning part. If he feels that the procedure is correct, he should implement it and if he feels any mistake, he should highlight it to the employee so that the employee can rectify himself. An employee is happy in rectifying his mistake rather than being immune to his workings. Managers, who pay attention to what the employees are saying, get good and quick response from the employees because what an employee needs is the attention of his manager. If you give your employees’ attention, you will get the same attention when you will require. 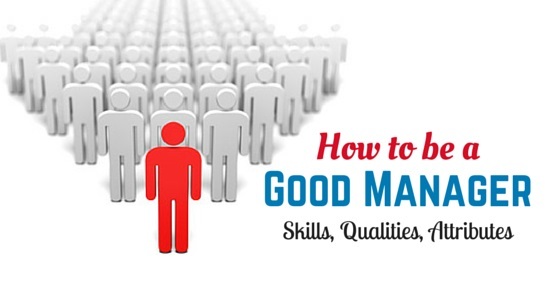 A manager should be ethical and practical in his approach. Some matters are not possible to implement as it is pictured theoretically. In such cases, it is the discretion of the manager to portray the work structure as it is well fit in the situation. If the manager is honest in his approach, his staff will learn honesty and ethics from him. A manager should not disclose his negative secrets in front of his employees. He should keep in mind that even after leaving the organization, the work culture and attributes of the manager shall still be in place in the organization in the form of the employees who have worked under him. If the manager himself is allowing tea breaks of fifteen minutes by himself only, then the employees will not misuse the office hours for break. It is the duty of the manager to schedule a time for starting and completing the break and also to see that the employees are following the time schedule in a disciplined manner so that their mind is also freshened up and the efficiency level also increases when you start a work after a refreshing break. A manager manages people as well as time and money. Apart from judging what his people are doing, he should see that his work is also completed within time. He should also see that whatever sanctioned estimate he is assigning to a work, the work shall be completed within the time frame and within that estimated cost. No extra ordinary enhancements shall be entertained for long and it will also create a bad impression that neither can the manager judge his estimates properly nor can he complete the work on time. A best motivator is the one who knows how to get the maximum from the employees. He shall figure out what his employees want and how can a manager arrange for his employees requirements so that the employees themselves feel motivated and work in a better fashion. People work bad because they still get paid and want to take life easy. To stop such practices, the better portion should be rewarded so that everyone tries to achieve their targets to gain rewards. These are the 20 qualities of a great manager. Management is nothing but a skill that can be learned and practised every day. To become a good manager, you have to work every day of your life. Just remember these points and start following two points daily and improve in that area. You will yourself feel that you have improved before you know it, along with others appreciation.